One of my customers has a client in Bloomington that just purchased a yarn store. So he brought me back two skeins of Jitterbug sock yarn, with the deal that I will use one of those skeins to make his daughter a pair of socks! I started her socks, but of course can't post them until she has them! I cast on for mine as well, in fun purple yarn! It's really pretty. The yarn is nice and stretchy too. I've had a really busy couple of weeks. Derby practice (which I missed last night, along with a few hours of work due to a weird sickness that struck me QUICK...ugh)! and work have both been incredibly crazy. Graduation parties and teacher appreciation days have been keeping the catering side of the shop super busy. Mothers day was total madness at work too. We had one hour where we grossed more than we typically do all day on Sunday! Dill and I were wiped after wards, but still managed to go see Star Trek in Imax with some friends. Of course, it was awesome. I wish we could afford to see it again in Imax, but I'd have to sell a car or something! Sheesh! Alright, back to it. I have socks to knit! 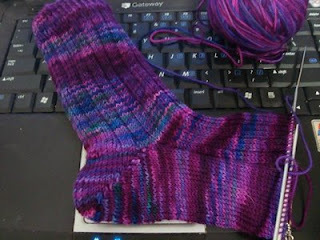 Love the deep colors of the sock. The purple is almost electric. I'm also glad you are still doing good business in this economy. Places are closing down around here. I love hangin with u and Dan...you guys are awesome! And I spied those cool purple sox too 8). IMHO the IMAX is too freaking overpriced. I mean really. Gimme the Rave anyday.